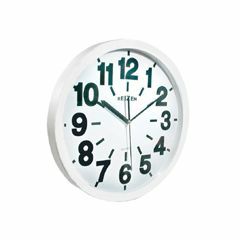 The Reizen Low Vision Quartz Wall Clock has a sweeping second hand. Light-weight. All metal. Easy & secure mounting. White face with large, 11/2"high numerals. Measurements: 14" in diameter Requires 1-AA battery (not included). Large numerals. Low vision aid. White with black numerals. Lightweight. Safe. Very quiet. Second hand moves smooth. I put this clock in my bedroom and never hear any sound coming from it. It's very quiet. The large numerals are great. I can see what time it is even if I don't have my eyeglasses on. Easy to see from a distance. Easy to hang. Quiet. This wall clock has the biggest numbers I've seen. My 90 year old father has barely any vision left, yet can easily read this clock without use of a magnifying glass or flashlight, etc. It is easy to set the time and put in batteries, then just hang it on the wall and get back to enjoying your life.